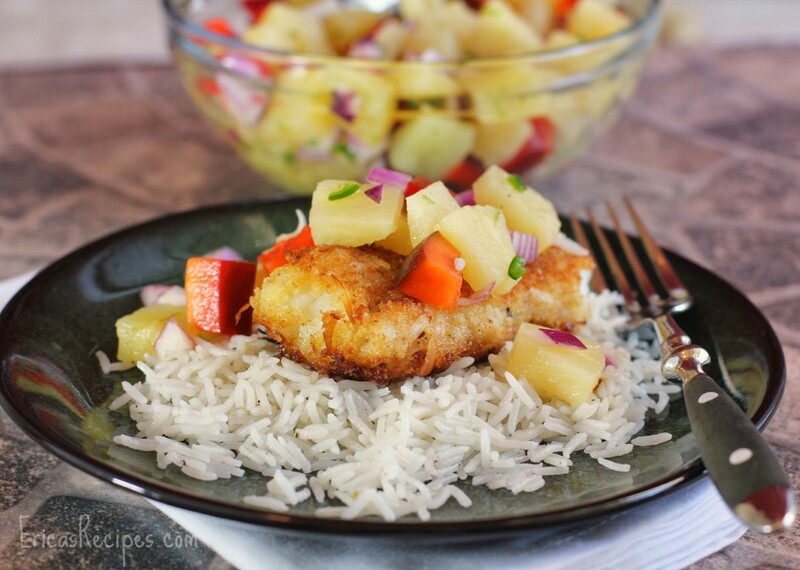 Light and crispy coconut crusted cod, topped with a lovely pineapple salsa and served over coconut rice. 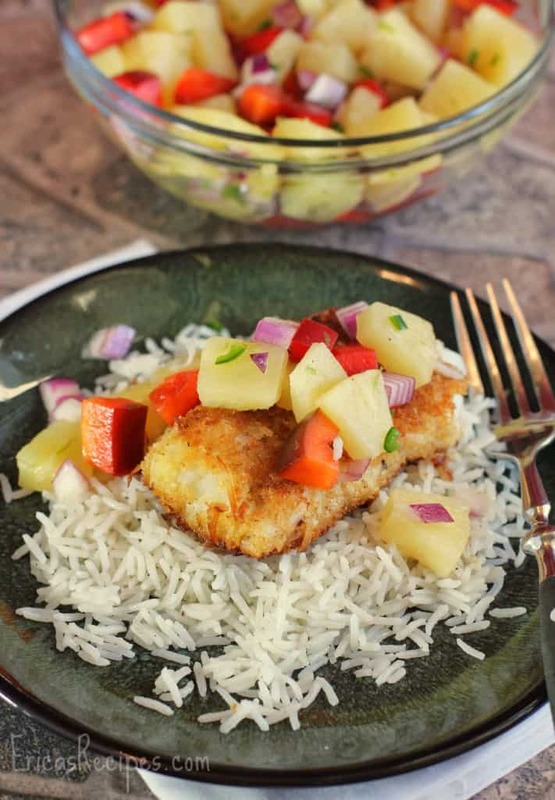 This inspired Coconut Cod with Pineapple Salsa recipe combines elements into a lovely dinner for all. My daughter and I have a serious thing for coconut shrimp. When we go to a restaurant, if coconut shrimp is on the menu, there is no question we will order it. With regular frequency we go to a particular local place just for the purpose of coconut shrimp …and they serve theirs with a raspberry sauce YUM!! Coconut shrimp makes us giddy, and we bond over it. On the other hand, having grown up in near Boston, I also have a thing for cod. In fact, I think it just may be my favorite fish. So it is no small point of pride that I have passed this love on to my daughter …she loves it too. 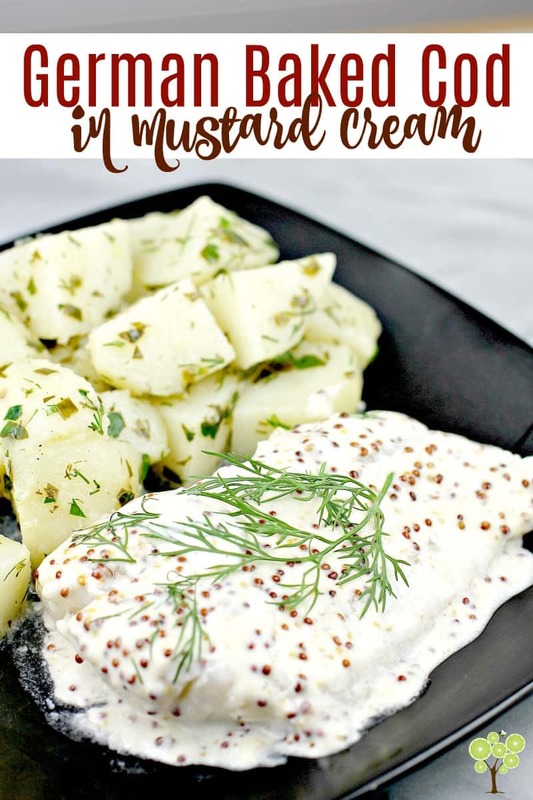 And in this recipe, I put them together for our Lenten Friday night fish dinner! Cod is, by default, delicious. Crunchy crispy fried cod is even tastier. Sweet coconut flakes make a ridiculously tasty coating on our already delectable cod. Combining with the sweet and juicy pineapple in the Pineapple Salsa with our crispy coconut cod sends the flavor over the moon. It may look a bit involved from the recipe directions, but this dish is quite easy to prepare. First, you make the salsa, which can be made in advance. Next, basmati rice is cooked with creamy coconut milk. Then the fish is coated and cooked, and, like all seafood, it cooks quickly. See? EASY. The only trick to this recipe is to not burn the coconut, which is why I just cook the crust golden on the stovetop, and finish the fish in the oven. 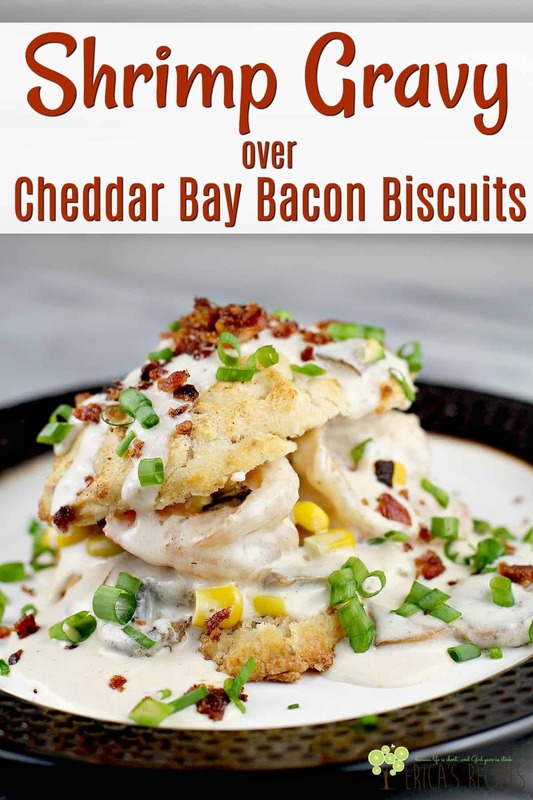 We really loved this and I can already envision so many occasions when I will made it again. So that’s it kids. 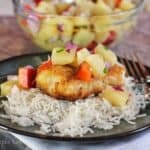 A fun spin on a classic, Coconut Cod with Pineapple Salsa is easy to make, kids LOVE it, and grown-ups will love it too. Light and crispy coconut crusted cod, topped with a lovely pineapple salsa and served over coconut rice. Add enough water to the coconut milk to make 2 cups total liquid. Add to a medium saucepan and bring to a boil. Add the rice, stir, cover, and reduce heat to low. Cook 15-18 minutes until all the liquid is absorbed. Fluff with a fork and add salt and pepper to taste (pinch of pepper should do it, but this will definitely need salt ..like half a teaspoon at least). Set aside. Toss all salsa ingredients together and chill until ready to serve. Take the cod pieces and season with salt, pepper, and Old Bay. In a small bowl, combine the egg with 1 tablespoon water to make an egg wash. Separately, combine the panko breadcrumbs and shredded coconut on a large plate. In a large, nonstick saute pan, heat the olive oil and butter on medium-high heat until the butter starts to bubble. One by one, dip a piece of cod in the egg, drain off excess, then put it in the panko-coconut mixture to coat pressing the crumbs in to coat evenly. Add the fish to the heated pan. Cook until golden on one side, flip, and repeat on the other side. Transfer to a bake sheet sprayed with cooking spray. Put bake sheet with the fish into the oven to finish cooking until they flake easily with a fork (4-5 minutes). If your fish is thin, this may not be necessary - they'll cook through on the stove top. But if the fish is an inch thick or more, finish it off in the oven. Serve over a bed of rice topped with Pineapple Salsa. Yields: 4 servings. This looks delicious. coconut rice and fish is a great combination. The pineapple salsa with we great on so many things, but I’ll thinking fish tacos..
G’day! Love the combination of ingredients! YUM! This entire dish sounds so delicious. And may I just say your rice is picture perfect. This looks so tasty and healthy, too. I love cod fish, breading with the coconut and coconut milk is ingenious. I’m going to have to make this sometime soon. Great recipe! I love the sound of your Coconut Cod, Erica, and the Pineapple Salsa looks delicious too. What a lovely way to serve cod. 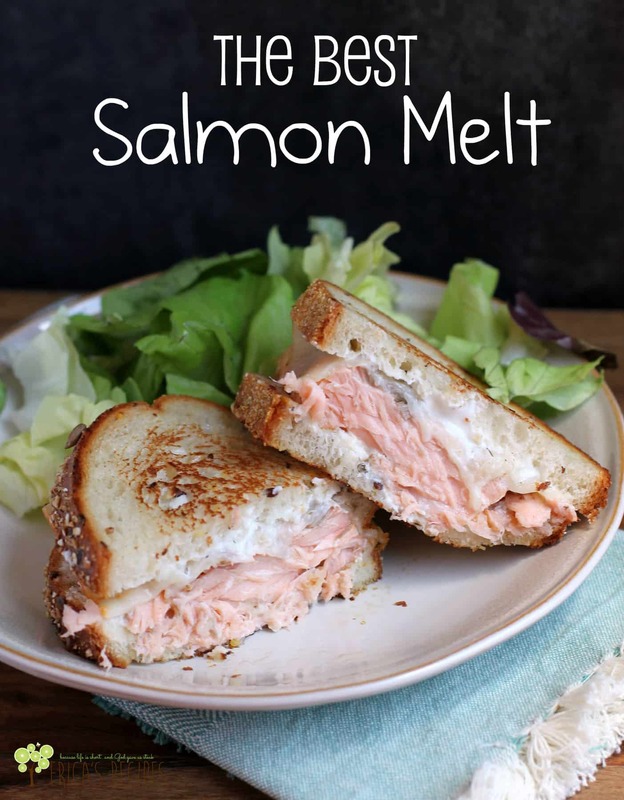 I’ve pinned this recipe to my Fish and Seafood Board on Pinterest. Thank you for sharing it with the Hearth and Soul hop. i need to try this for my kiddos, they love cod. Thanks for sharing at Simple Supper Tuesday. Hope to see you again next week! How colorful and pretty! Thanks for linking up with the Tasty Tuesday’s Link-up. 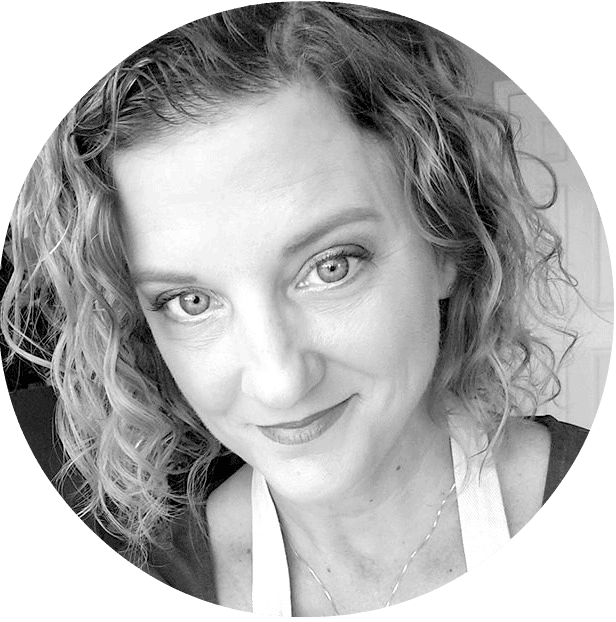 I have pinned your post to the Tasty’s Tuesday’s Pinterest Board!